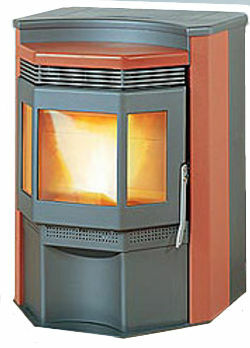 The Rika Integra 11, still in production from the days when it used to be called the Austroflamm Integra, is a very popular high output stove with bay window styling and a choice of accent colours. It produces up to 42,000 btu. per hour and can heat an area of 2,500 square feet and has an automatic hourly cleaning cycle. The Rika Integra has programmable control with different settings possible for every day of the week. This function is also available on the optional wall thermostat. 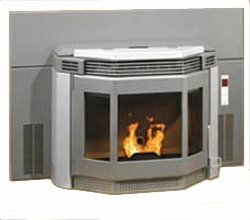 This is a very high quality pellet stove, with a stainless steel heat exchanger and cast iron firebox back plates. The motors run on ball bearings for quiet operation. The Integra has an automatic cleaning cycle that is factory set to happen every hour. The self cleaning frequency can be adjusted by the owner to accommodate different standards of fuel quality. Hopper Capacity Freestanding 145 lbs. insert 99 lbs. Burn time Freestanding 145 hrs. on low heat setting. insert 99 hrs. Weight Freestanding 375 lbs. insert 258 lbs. Large 32 in. by 46 in. The Rika Integra has been around for a while and is still highly regarded and modern looking. Daily: Check the burn pot, wipe the glass, clean the heat exchanger. Every few days: Clean the burn pot and empty the ash pan as needed. Monthly: Clean the heat exchanger area behind the firebox back plates, clean under the burn pot, clean the door gaskets. Yearly: Empty and clean the hopper, clean the venting system, clean the combustion fan housing. If you would like to leave a review of the Rika Integra 11, please use the form on the contact page.